The Easiest Healthy One Pot Dish! 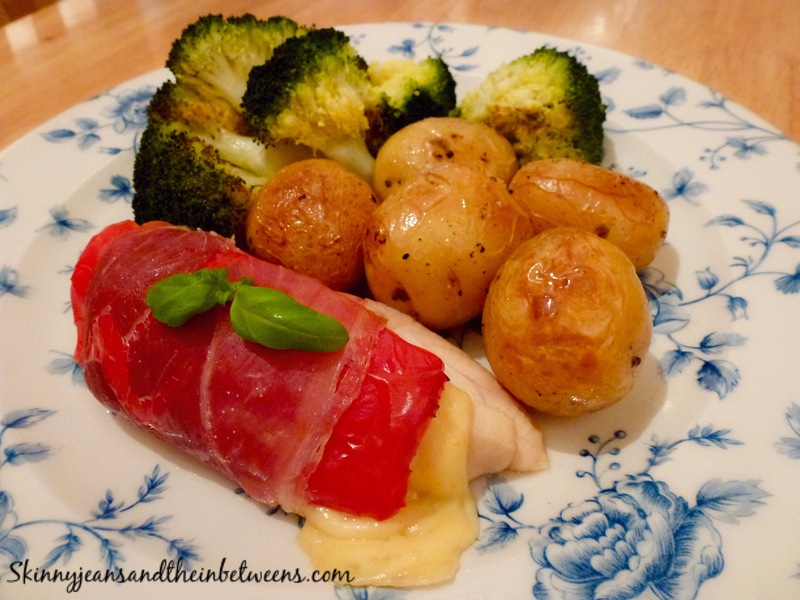 I cannot begin to tell you how simple this was to make, the chicken stays incredibly moist & juicy due to being wrapped in the prosciutto & the sweetness of the pepper & creaminess of the cheese is just divine! It lifts a plain ordinary chicken dinner to a new level. It all goes in one casserole dish in the oven so minimal fuss or mess involved. I just lay the cheese & pepper on top of the chicken which also avoids all that faffing about trying to cut a pocket in the meat, it honestly couldn’t be easier! You could probably make this lower points again by using light buffalo mozarella sliced instead, which I originally intended but I didn’t have any in the fridge (the maasdam is 3 Smartpoints so adjust accordingly). All items were bought in Aldi. Mine was 10 Smartpoints (or 4 Smartpoints on No Count). A light tea tonight! 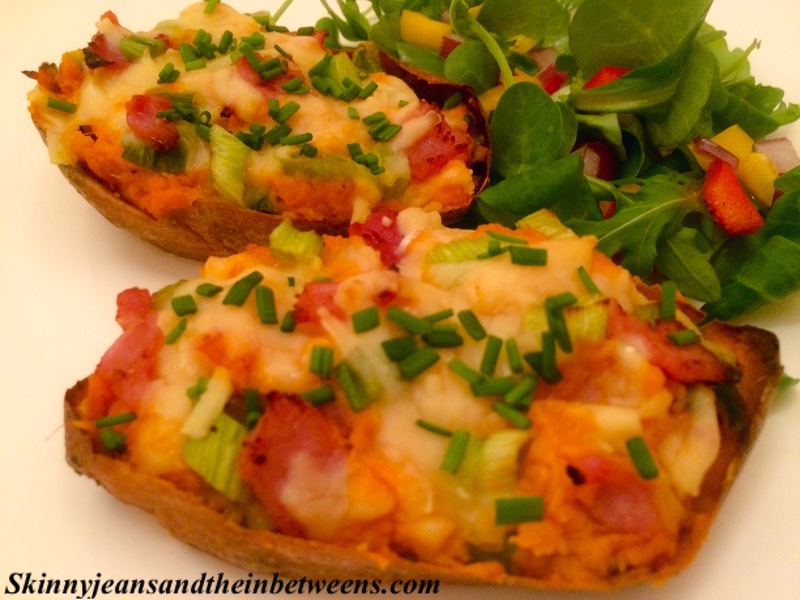 Delectable Twice Baked Sweet Potato with Bacon & Cream Cheese accompanied by Sweet Pepper & Rocket Side Salad with Tangy Orange & Mustard Dressing. 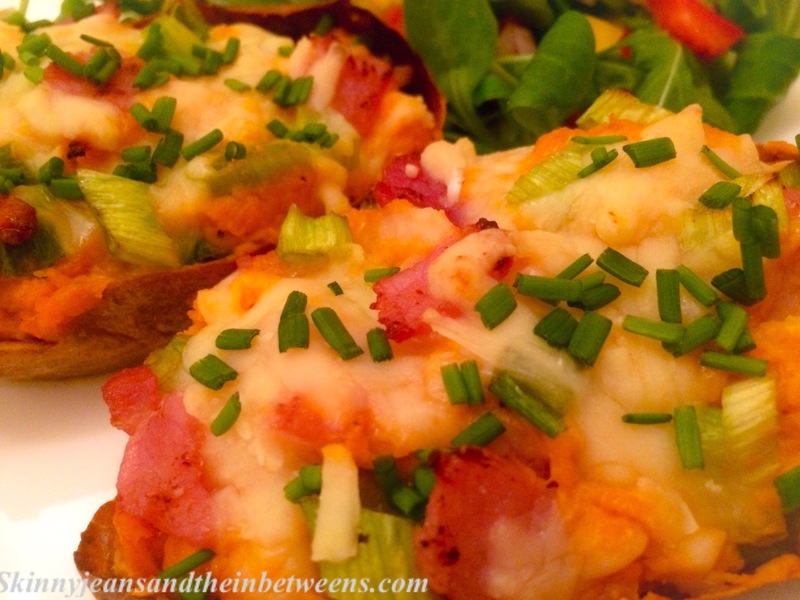 If you’re a fan of Sweet Potatoes you will love this! You can of course substitute ordinary potato either it will work just as well. 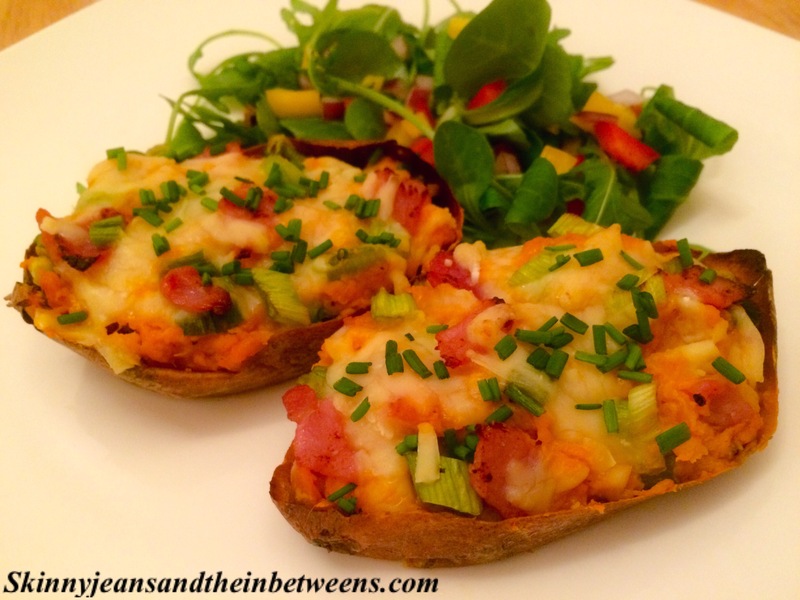 I love twice baked potatoes & have featured them several times on the blog. They are just so moreish! 8 propoints or 1pp on F&H I made this for myself so it serves 1 but you can easily multiply the recipe if serving more than 1 person. I Hope your Monday evening is great. Black Pepper Preheat your oven to 200c and wash the sweet potato well. Place in the hot oven for an hour until soft. Set aside for about 10 minutes to cool while you prepare the filling. Fry the bacon pieces in a medium hot pan sprayed with oil for 3 to 5 minutes until fully cooked through & browning. Add the sliced spring onions to the pan stirring for about 30 seconds to a minute until just starting to soften. Carefully slice the sweet potato lengthwise in half with a sharp knife. Carefully scoop out the flesh from the sweet potato into a bowl leaving a small edge of sweet potato in the skin if possible to make it sturdier (don’t worry if it all comes away it will just be a bit extra delicate when lifting. 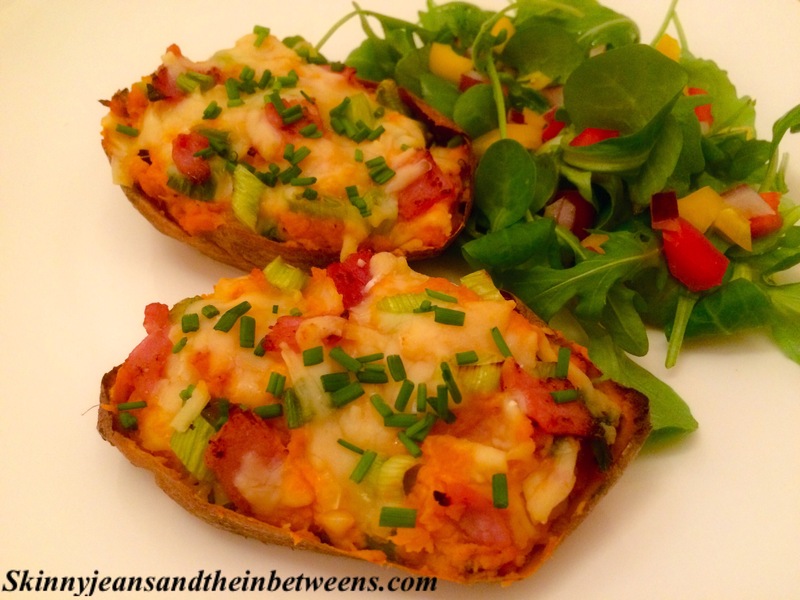 Place the cream cheese into the bowl with the sweet potato & season with salt & black pepper. Mash well with a fork making sure the cream cheese is well combined with the sweet potato flesh. Add the bacon & spring onion mix (I like to reserve a few pieces for the tops of the finished potatoes to garnish) Mix this through gently with a spoon. 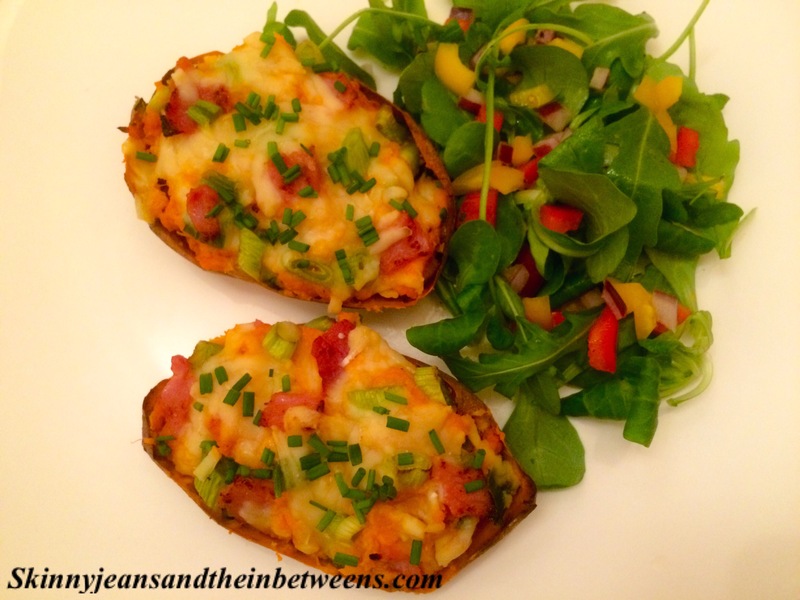 Place the empty potato shells in an ovenproof dish or on a baking tray that you have sprayed with oil & spoon the sweet potato mix evenly & lightly back into each potato skin. Top with half the grated cheese per potato (add the reserved bacon & spring onion topping at this stage if you are following that step). Return the potatoes to the oven for about another 20 minutes until the cheddar has melted & is bubbling. Meanwhile prepare the dressing for the salad by mixing all the ingredients together very well in a small bowl or glass. Prepare the salad ingredients & lightly drizzle with the dressing. Very carefully lift the potatoes onto your plate with a spatula, top with chopped chives & enjoy! I love dips, they’re just perfect for nibbles whilst you’re thoroughly engrossed in a weekend movie & a must if you’re entertaining company. 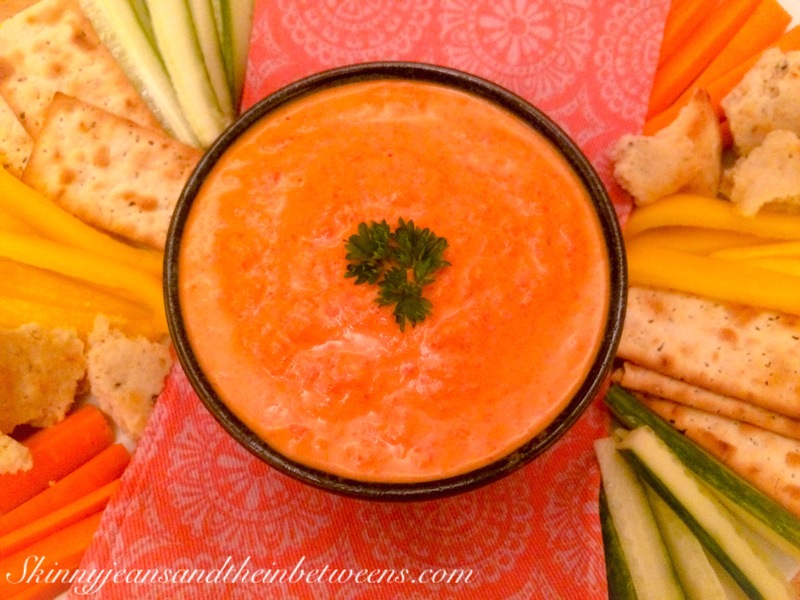 This one is simple & tasty with a wide variety of choices you can prepare to use for dipping. There’s a beautiful depth of flavour that comes from roasting peppers & a lovely undertone of roasted garlic & shallots will have you going back for more & more of this gorgeous dip but that’s ok because it serves 4 & is a big fat zero pro points per serving & just 2pp for the whole bowl. A healthy & guilt free weekend treat! Crackers/Naan/Pitta Breads/Tortilla Chips for dipping (you will need to add points for your chosen quantity of these). Preheat your oven to 250c. Wash & dry the peppers. Peel the outer skin from the shallots. Leave the garlic cloves in their skin. Line a baking tray with tinfoil & lay the whole peppers, shallots & garlic (in the skins) on top. Bake for approximately 30 minutes until the peppers are starting to char black in places & the skin goes wrinkly. Remove the baking tray from the oven, cover the whole lot with tinfoil & leave to cool. 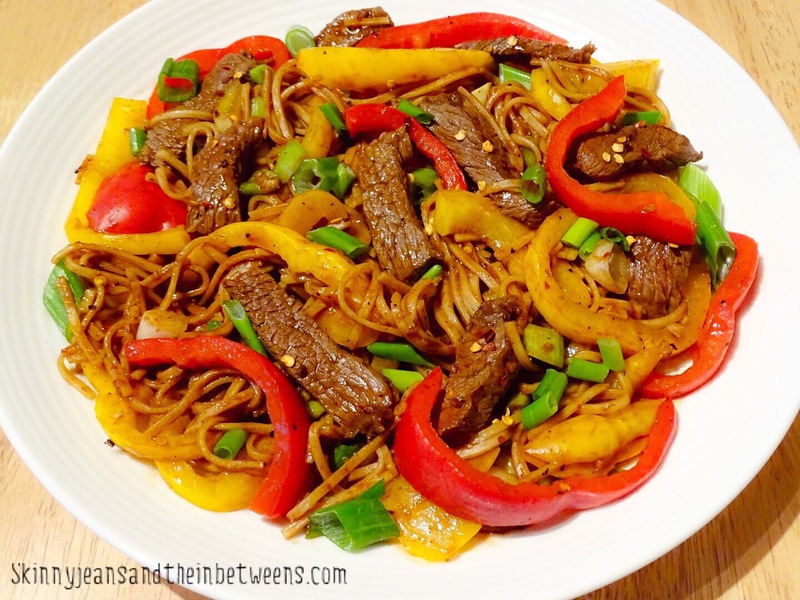 Remove the stalks from the peppers & deseed. Peel the peppers & place in a food processor with the shallots and some of the juice that the peppers have released. Cut the end off the garlic & squeeze the softened garlic out into the food processor. Add the quark & season with salt & pepper. Blitz until smooth & place in a bowl. Chill for a couple of hours before serving. 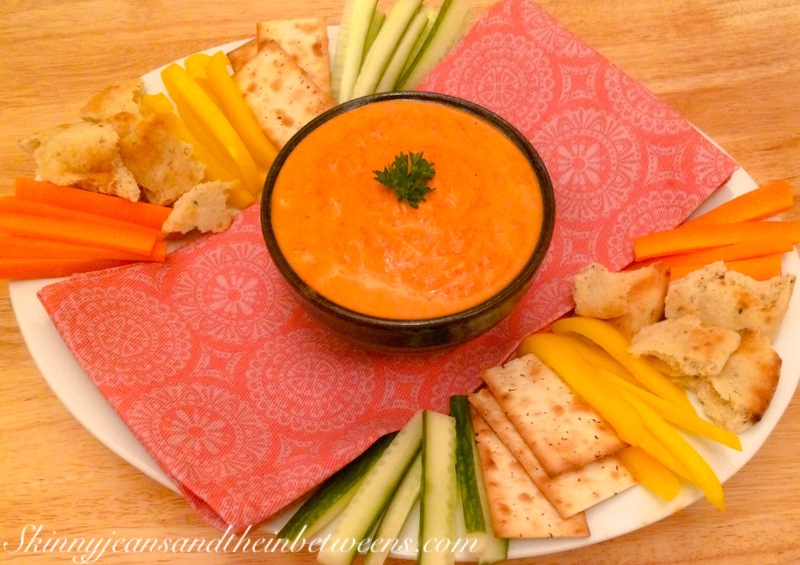 Serve with your choice of raw crudités (carrots, cucumber & peppers are good choices) or Crackers/Naan/Pitta Breads/Tortilla Chips for dipping (you will need to point your chosen quantity of these). This will last 3/4 days in an airtight container in the fridge. 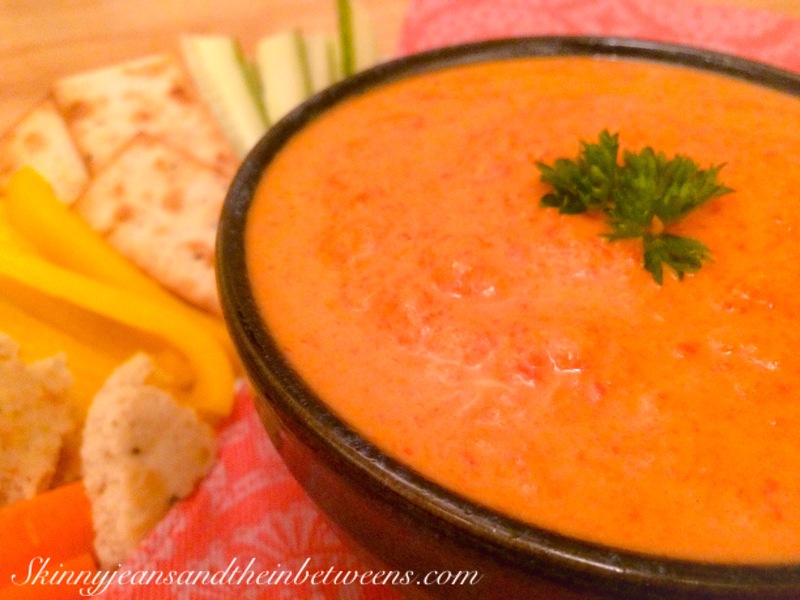 It’s very versatile you can use it to serve with chicken or fish as well as a dip. Enjoy!